MacLean’s devilishly fun debut novel is an absolute delight: rich in supple wit, suffused with sensuality, and enlivened with a wonderfully engaging cast of characters. 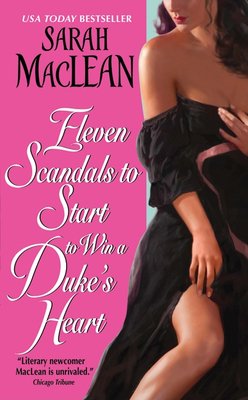 MacLean has penned a fast-paced, funny tale with a marvelous cast of characters who captivate and enchant. This book should come with a warning: Once you start, you won’t want to put it down! An entertaining Regency debut.... The 19th-century clothes are luscious, the 21st-century sensibility is raunchy, and it’s all implausible, escapist fun. Wow, what a great book! I love it. One of the best wrenching-heart scenes ever...Fabulous! Sarah MacLean became an instant must-read author with Nine Rules to Break When Romancing a Rake last year. Fourteen months and another two books later, that hasn’t changed.